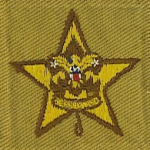 The Star Rank was originally the an award given after Life, when a Scout had earned an extra 5 merit badges beyond the 5 required for Life. 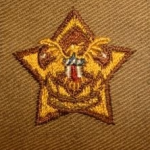 The required merit badges for Life were all fitness and first aid related (First Aid, Athletics, Life-saving, Personal Health, and Public Health), but then any extra 5 merit badges could be earned for Star. 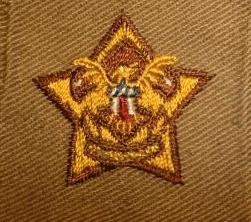 In 1927, the order of the two ranks was switched to the present model, recognizing that it was easier to earn any 5 badges compared to the specific 5 for Life. The most valuable Star Insignia are found without the knot hanging below the Star. As with almost all Boy Scout Collectibles, Insignia on cut cloth will be less common and worth more than those with embroidered edges or rolled edges. 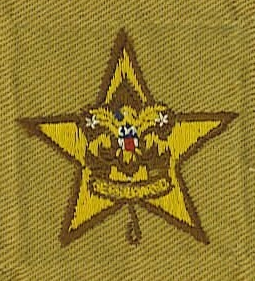 There are at least 10 types of Star Cloth Badges that are documented before the embroidered edge badges were issued, many of which have smaller variations based on the cloth they are on. Most of these are still fairly common and will be worth less than $50.